Story originally published in the South Carolina Business Education Association Spring 2013 Newsletter. It is often said of New York City that, “If you can make it here, you can make it anywhere.” Last month young entrepreneurs from three South Carolina schools set out to make it big and prove they have what it takes to make it anywhere. The students are part of Virtual Enterprises International (VEI), an innovative business education program that allows students to create, own, and operate their own businesses in a simulated environment. As participants in the 2013 Youth Business Summit, April 9-11, sponsored by the New York Life Foundation and HSBC Bank, students had multiple opportunities to display their business acumen and prove they have what it takes to succeed in the fast-paced business world. The National Business Plan Competition, one of the most prestigious and rigorous business plan competitions for high school students nationwide, is a competition that challenges VEI students from across the country to demonstrate their global business expertise through written business plans and oral presentations. Firms presubmit written business plans and have two opportunities to present and defend their plan to a panel of Fortune 500 executives. The top six teams qualify for the national final round. Three innovative firms meeting different market needs, earned the right to represent South Carolina by virtue of their showing at a state qualifying event in January. Over 500 VEI firms compete in this event beginning on the state level. 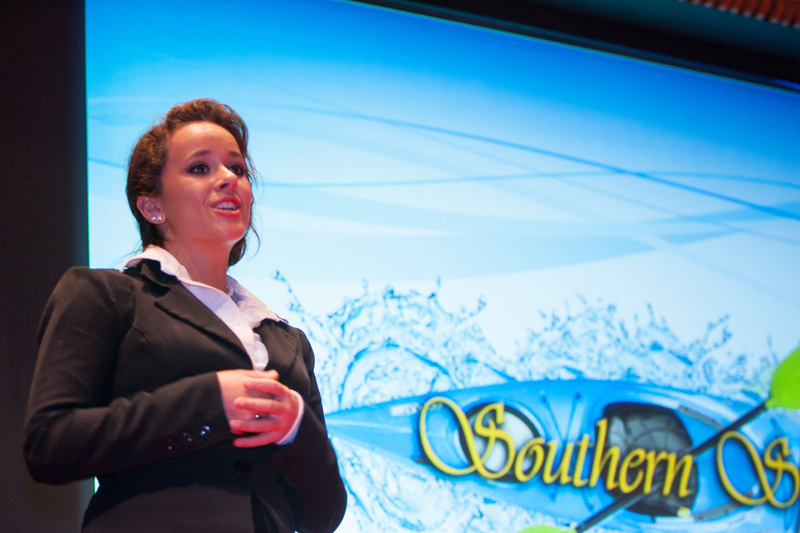 When the dust had settled, South Carolina had recorded its most successful showing in the National Business Plan Competition in South Carolina’s 12-year history. Southern Splash from White Knoll High School earned a 3rd place finish while Greer High School’s firm, Chocolate Couture placed 6th, and St. James High School’s firm, Destination:Food Nation, placed 9th in the national event. One of the unique events at the Summit is The Global Business Challenge (GBC), which allows an opportunity for VEI students to experience the global economy and develop expertise that will be critical as they move forward in their education and careers. In early March, students received a business school case study on Starbucks and had the opportunity to read and review the case and examine the challenges, opportunities, and risks facing the company. On the morning of the event, students were randomly assigned to a multinational team of 6-7 students and were tasked with solving a series of complex business situations using their combined knowledge of the company. Over 200 students participated on 25 teams in the competition from eight states and six foreign countries. The mission for each team was to analyze company data, identify relevant information for the assigned task, and prepare a solutions-based presentation to industry partner judges. Each team had 2.5 hours to complete this task. As the teams worked, judges observed and evaluated students on performance, professionalism, and effectiveness. At the end of the 2.5 hours, teams were required to make a 10- minute presentation to judges, and then navigate 5 minutes of case related questions. At the conclusion of the event, South Carolina had three students who played key roles on the global winning teams. Richard Handler from Greer High School took on the role of team leader and guided his team to 1st place. Jackson Tipton, also from Greer, played a key role on the team that placed 2nd while Jordan Walker from St. James High School was on the 3rd place team. The Summit’s events concluded with The Virtual Enterprises International Trade Show, an event that allows students from around the world who participate in the worldwide network of VEs to exhibit a wide range of products and tout their marketing campaigns. Students competed in various competitions related to the event including Best Booth, Best Sales Pitch, Best Web Site and Best Catalog. Once again, South Carolina firms earned recognition in multiple categories led by St. James High School who earned 5th place finish in Best Catalog. Schools receiving Honorable Mention (Top-10) finishes include White Knoll High and Greer High in Best Catalog, Best Web Site, and Best Sales Pitch. Virtual Enterprise is a growing program with over 500 firms nationwide and 35 firms in 28 schools in South Carolina. With a curriculum aligned to Common Core and NBEA standards, the program prepares students for the world of work ahead of them. Countless alumni can attest to the quality of the education VEI provides and the role it plays in preparing them for future success. This program is designed to prepare the business leader of tomorrow today. If you are interested in adding VEI to your program offerings or a business leader interested in mentoring young entrepreneurs contact Dr. Christine Haff, South Carolina and Southern Region Director at chaff@veinternational.org.